Persistence Market Research in its report ‘Costume Jewelry Market: U.S. Industry Analysis and Forecast, 2016–2024’ has provided a comprehensive overview of the U.S costume jewelry market. For the eight year forecast period 2016-2024, the U.S costume jewelry market has been extensively studied on the basis of various factors. The U.S is popularly thought of as a trend-setting country and one that is able to make the entire globe follow in its wake. Important developments that shape the U.S costume jewelry market have been studied along with the key governing trends. The analysts at Persistence Market Research have also given their opinion on the future of the U.S costume jewelry market. This should enable players and other key stakeholders to make critical medium and long-term investment decisions in the U.S costume jewelry market. The U.S costume jewelry market report starts with a succinct executive summary that includes both the market definition as well as the market taxonomy. An analysis of the U.S costume jewelry market is done on the basis of important metrics such as market size, Y-o-Y growth and absolute dollar opportunity. The value chain and production flow in the U.S costume jewelry market is spoken about briefly to give readers an understanding of which area they wish to target or focus on. Some of the key stakeholders in the U.S costume jewelry market include raw material suppliers, manufacturers, and distributors/ wholesalers. The production flow is explained beginning from the acquisition of raw materials and culminating in the inspection of the final product to be sold in the U.S costume jewelry market. After this, the report mentions the key drivers, restraints, opportunities and trends that should play a major role in shaping the U.S costume jewelry market till the end of the forecast period. The next section of the U.S costume jewelry market report touches upon the market analysis and forecast on the basis of Price Range, Product Type and Distribution Channel. The Basis Points Share analysis (BPS), Y-o-Y growth projections, the market value forecast along with the market attractiveness has been detailed. The absolute dollar opportunity in the U.S costume jewelry market is also mentioned with actual data provided for the year 2015, expected data for the year 2016, and forecasted data for the remaining duration of the study. The market attractiveness of the U.S costume jewelry market can be very helpful to any company that wishes to enter this fast-changing, global trend-setting market. No market is completely free of competition and this applies to the U.S costume jewelry market as well. The last section of the U.S costume jewelry market report gives the reader an idea of the market structure, competitive landscape and the main companies currently trying their luck in the U.S costume jewelry market. A broad overview, key financial metrics, long-term strategies and recent developments of high-profile organizations such as Chanel, Guess, Versace, Hermes, H&M, Zara and Gucci have been mentioned in the U.S costume jewelry market report. By reading the company profiles, a stakeholder in the U.S costume jewelry market may understand which company is in a comparatively weak position and can be challenged to be potentially replaced in the U.S costume jewelry market. The analysts have used certain assumptions and acronyms while preparing this informative report on the U.S costume jewelry market and these have been documented for the readers’ benefit. Persistence Market Research has employed a proprietary, unique methodology that relies on extensive primary and secondary research to draft the U.S costume jewelry market report. The primary research captures important market data and information that is gathered through interviews conducted with all major stakeholders such as manufacturers and suppliers in the U.S costume jewelry market. This data is thoroughly verified, validated using the triangulation method and then lastly scrutinized with the help of advanced tools to provide expert analysis of the U.S costume jewelry market that is both qualitative and quantitative in nature. 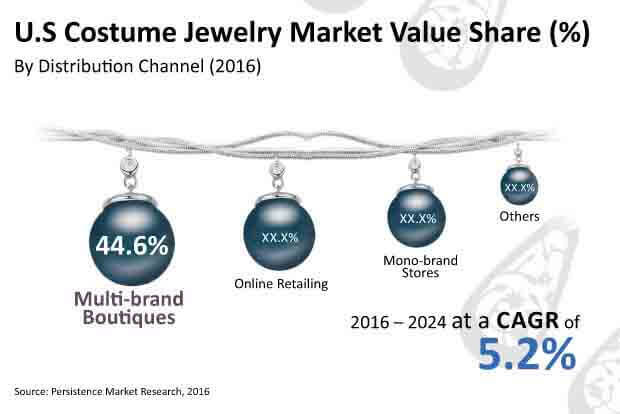 In the year 2016, the Multi-Brand Boutiques segment accounted for a market share of nearly 45% and the Online Retailing segment held a share of 33% in the distribution channels category in the U.S. costume jewelry market. These statistics imply jewelry makers will have to target either one or both of these distribution channels to ensure that their products reach end consumers. With the proliferation of smartphones, 4G connectivity and a strong distribution infrastructure, e-commerce enables customers in even smaller American towns to access the very best available in the U.S. costume jewelry market. Online retailers now provide a diverse selection of products through dedicated catalogues for both international patterns as well as designs. In addition, online stores provide costume jewelry at highly competitive prices along with offering various coupons, offers or instalment schemes to encourage purchases. All these factors are anticipated to positively impact the U.S. costume jewelry market and drive growth till the end of the forecast period. Online retail is typically much more convenient in terms of both easy access and payment options, home delivery that may even be free or a much more flexible return or exchange policy than traditional single or multi-brand boutiques. Women are no longer confined to their homes and have joined the workforce in droves by becoming completely independent. Working women are a major segment that contribute substantially to the U.S. costume jewelry market as they are either employed in high jobs or run their own businesses. This leads to a higher disposable income but these women are usually pressed for time and cannot visit boutique stores as frequently as they would like. Online retailing is essentially their saving grace as the choice and convenience it offers is simply unbeatable. Women can shop when they want and where they want at the mere click of a button. Another factor that cannot be ignored is the importance given to personal appearance in the corporate world today. There is a growing desire among women to both look and feel good and this should make them look more closely at the U.S. costume jewelry market. In March 2016, Chanel S.A. launched its inaugural e-Commerce website to boost its reach and expand its target audience. At the end of the same year, its rival Gianni Versace Spa transformed its website and combined it with the brand’s e-Commerce platform. This should almost certainly raise awareness about the importance of Online Retailing and other key companies in the U.S. costume jewelry market are expected to follow suit in the near future. The almost universal penetration of internet access throughout the U.S. has allowed the emergence of e-Commerce as a convenient and comfortable sales channel for a number of products in the U.S. costume jewelry market. This includes bracelets, bangles, earrings, finger rings, necklaces, pendants, anklets, brooches and much more. Purchasing costume jewelry online is a newfound trend observed among a number of customers in the U.S. costume jewelry market. This can be largely attributed to big fashion brands providing their products via online channels along with the increase in brand-conscious customers. The internet, e-Commerce, numerous online portals and review websites have made it extremely easy for customers to compare not just products and prices, but also design, service level, product origin and even manufacturer or supplier details. The amount of information available along with the relevant details have helped make the U.S. costume jewelry market far more transparent. Therefore, an increasing number of customers are opting for the online route to cater to all their jewelry shopping desires.